QuiltCon began for me on Wednesday at 3 am so that I could leave for the airport at 4 am. 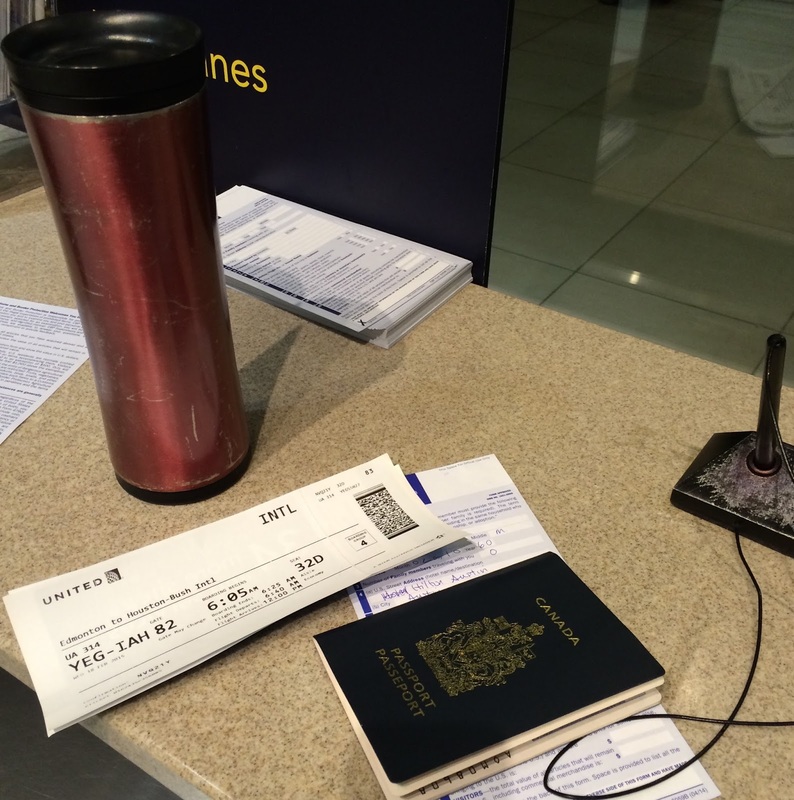 I go through US customs before I get on a plane - most larger Canadian cities have this service - but it means getting to the airport quite early for your early flight. 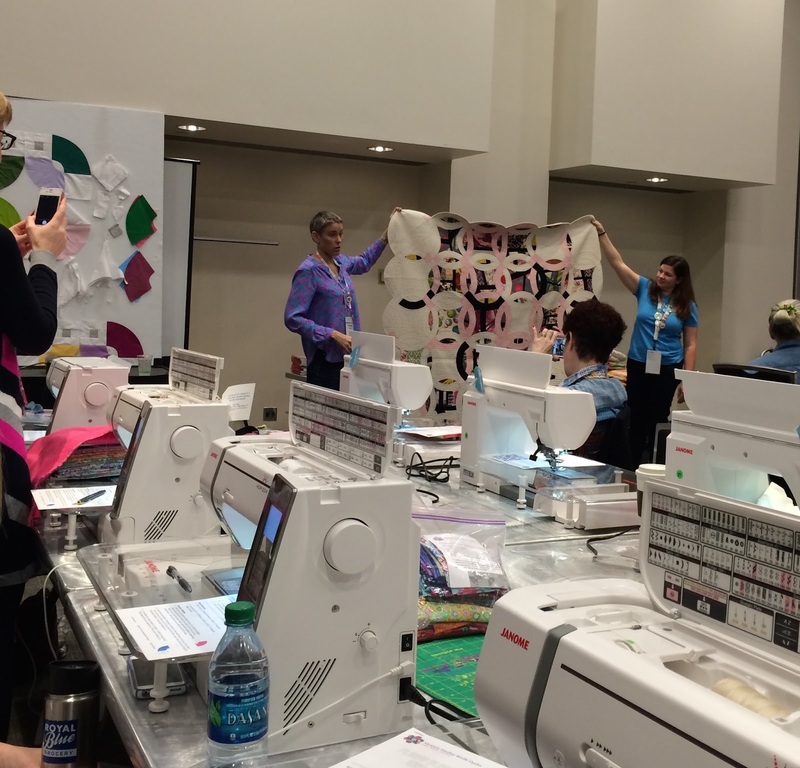 I went to QuiltCon for a number of reasons: the quilts, the classes, the people and the MQG. On Thursday, I told you about my quilts, so today it will be the classes, with the rest to follow. It appears that internet registration systems and I have good karma. I had no difficulty registering for 4 full day classes. Despite feeling guilty as others had trouble getting into classes, I decided that I really wanted to learn so I kept all the classes I am so glad I did. It is a long way for me to go to a quilt show and the total price tag was high, but I sure learned a lot. 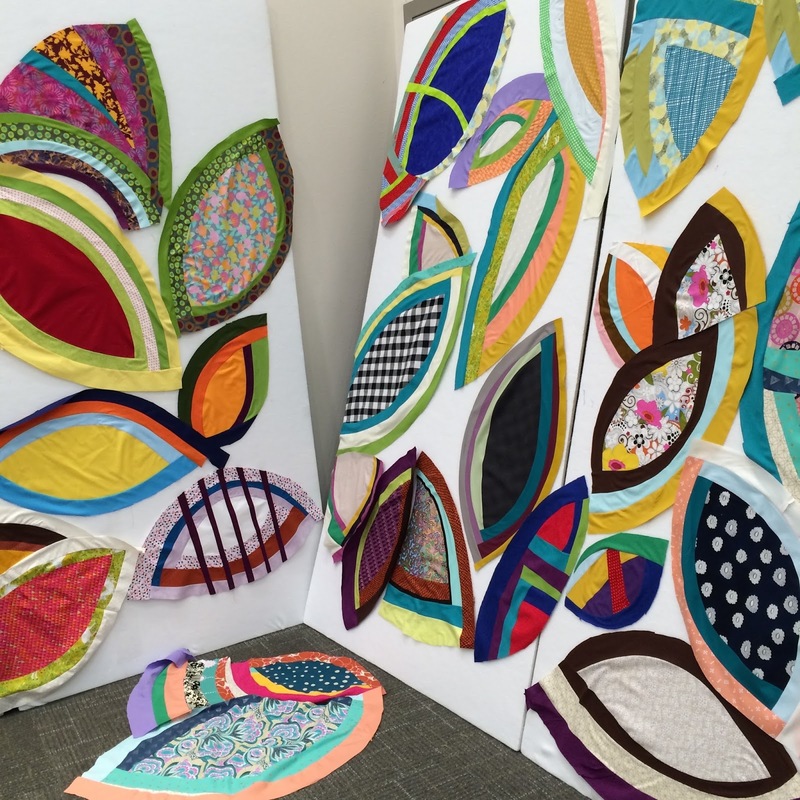 On Thursday I learned a lot about quilting negative space and also modern quilts overall. 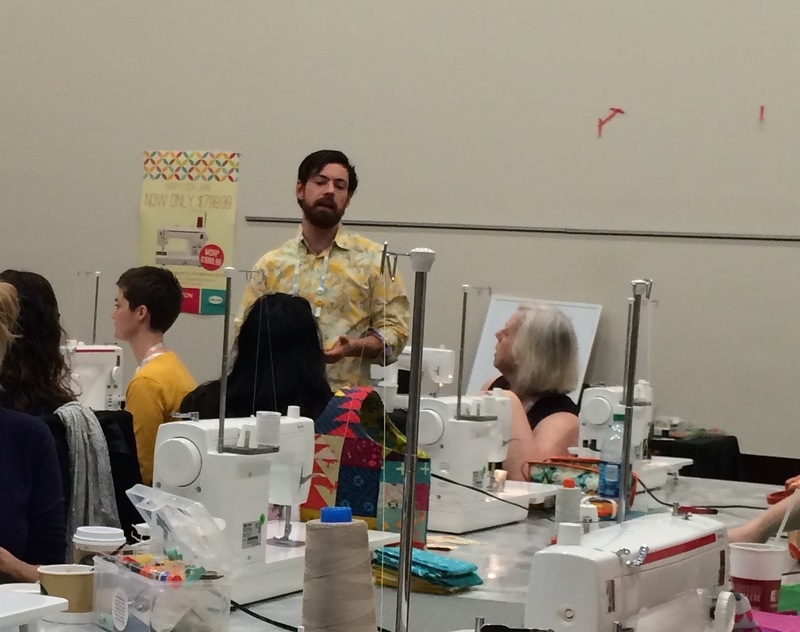 Krista Withers is a fantastic teacher, and her compositional quilting class was the best quilting class I have taken so far. The day was a delight and I am eager to put what I learned into practice. Here is my practice piece. 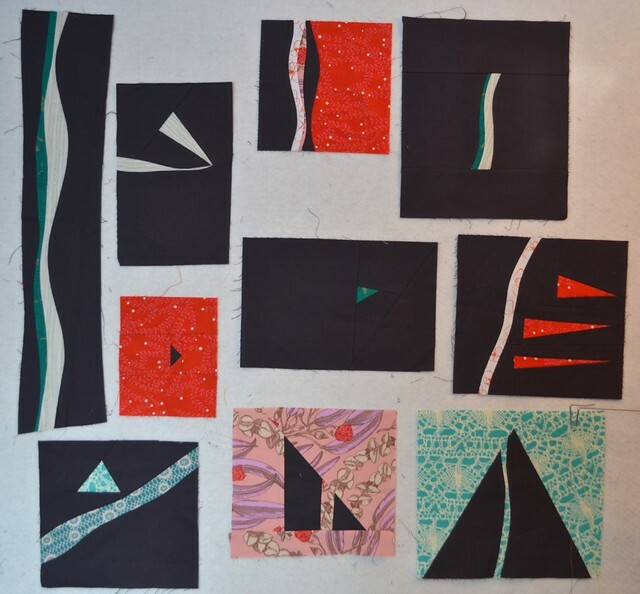 Krista's approach to teaching quilting was different from any other class I had taken - at the end I had this nice completed panel, not a bunch of messy starts and stops, to take home. She made a panel too, while the class did, so one could watch and ask questions and at the end she gave that away to one of the students. On Friday I spent the day with Sherri Lynn Wood, learning how to use bias strips to outline curved shapes in a fun improv way. 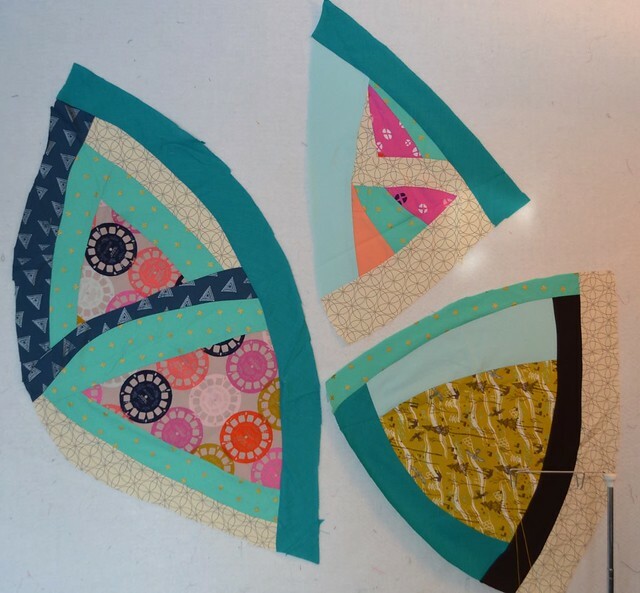 Sherri Lynn is a lovely teacher and shared a wealth of really great tips and tricks for dealing with the bubbles and waves that often arise when piecing large curved bias edges. 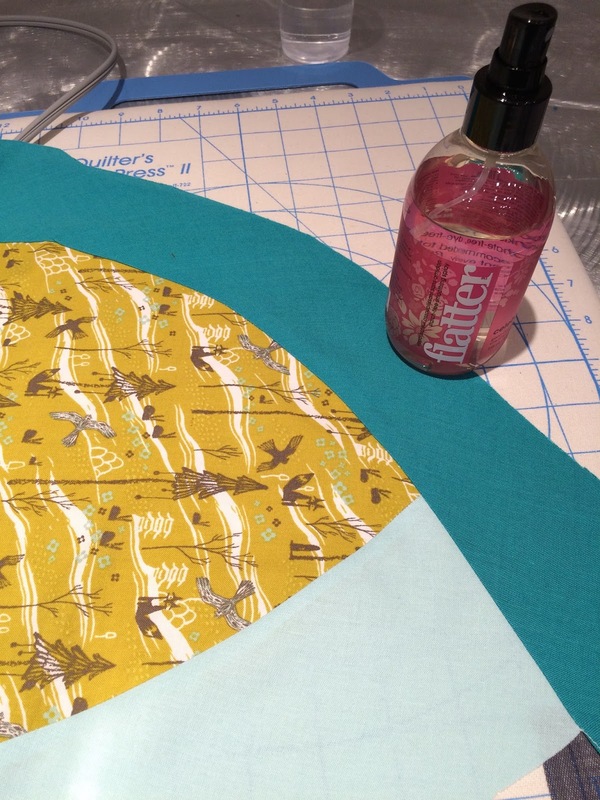 Flatter, or a similar product is your friend when using this technique. That photo shows the creations of the entire class! And there are my blocks. I also bought Sherri Lynn's book, Improv Handbook for Quilters, so I can explore more of her techniques. Saturday was a day with my friend Victoria Findlay Wolfe. 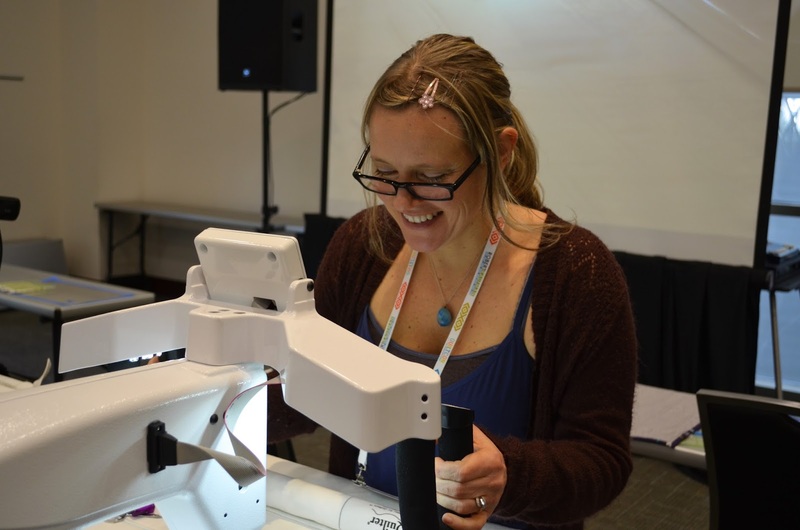 Victoria is one of my favourite overall teachers for quilting - I come away from her classes having learned a lot and very inspired to be creative with the techniques she has shared. 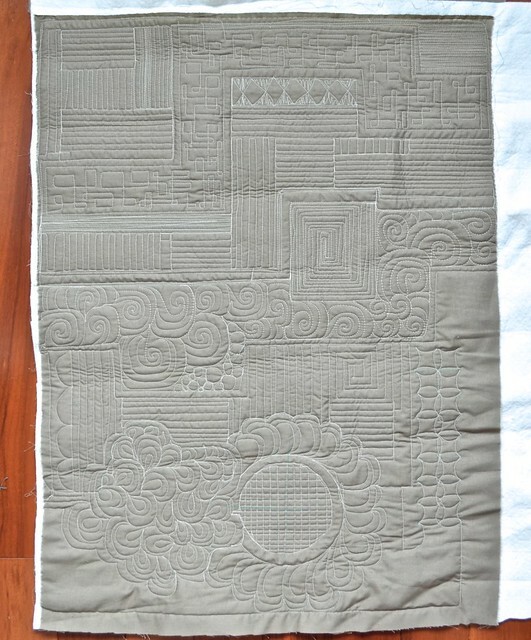 The workshop was one of the projects from her book, Double Wedding Ring Quilts, which I also bought. I am really loving these huge blocks, and hope to finish this quilt soon. I totally recommend a class with Luke Haynes if you get the chance. I love his work and signed up for this Sunday class mostly just to see what he was like. He asked us to work on something different from what we have been doing a lot of lately, to explore scale and shapes, whatever we felt like doing. The class met as a group several times to work together to share ideas and tips on each person's progress. Luke shared many art and design concepts and was really nice to chat and work with. I played around with triangles and curves, working on a small scale. I have to say it was a relaxing and lovely day where I learned a great deal. I finally started unpacking my QuiltCon stuff, and I think that I am ready to get back to sewing today too. I'll share more tomorrow. That looks like being really worth the journey. Fascinating information and hands-on practice. Wow! You were so productive! I LOVE your panel from the quilting class. That is amazing work. It looks like you ended up with a full slate of great classes! I'm looking forward to seeing more of the projects you started as they are all looking really neat! That is so awesome - your brain must just be full!! I saw some of Luke's pieced at the Rocky Mtn Quilt Museum here in CO - I was amazed!! Thanks for showing and telling about your classes! I like your classes. I just got familiar with Victoria and ordered her book. It really opened my eyes to what I want to say in my quilts. I do like DWR. The curved bias piecing is wonderful and those last blocks for a relaxing finish are marvelous. I. too, look forward to seeing how the MQing class will influence your work and seeing some exciting finishes. welcome home! Great post, Leanne!!! I really had the best time ever, that was so worth gettng up at 3 a.m.
What an awesome class line-up! So glad it all proved to be inspiring and fun! You had some exceptional classes. I've taken a class with Sherri and was very inspired by her improvisational style. I look forward to seeing how you incorporate all these new ideas in your work. Well now I wish we had spent more talking about that first class of yours, that quilted panel looks great and like it was a lot of fun! I'm so glad we got to meet Leanne! It sounds like a wonderful way to spend a few days! Looks like you had a lovely time. 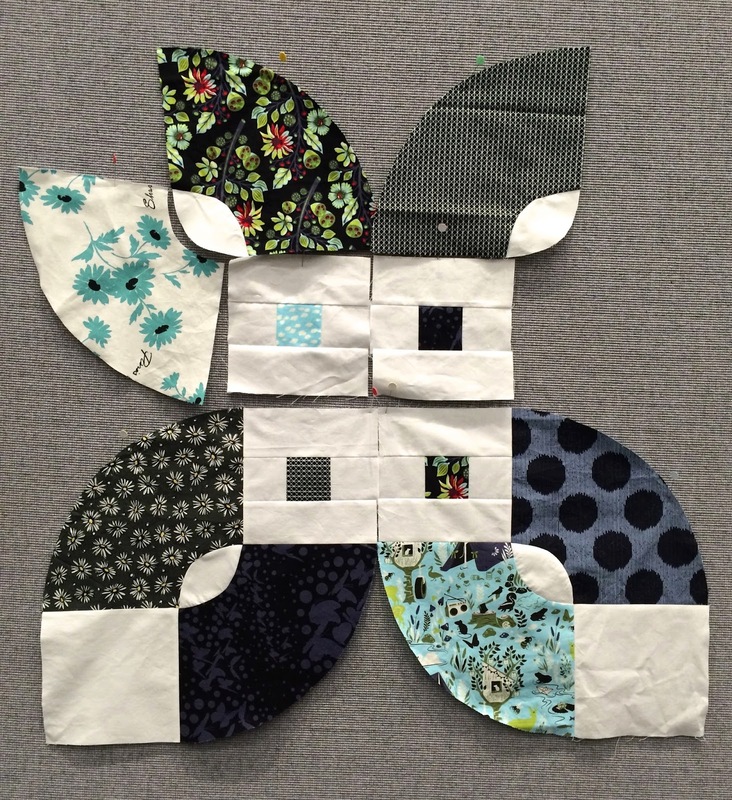 That negative space quilting looks especially fun! That sounds simply glorious. I'd love a class or lecture by Luke and am completely interested in the DWR book. Off to check it out! Sounds great Leanne. I'm a bit green with envy. No just kidding, I'm glad to hear you enjoyed the classes. Looks like a great time. What wonderful classes! So enjoyed having you in class Leanne! Great to meet you finally!